Earn $12.89 in VIP credit (1289 points)What's This? The PRO Tharsis Trail Stem pairs with the Tharsis Carbon MTB Handlebar for a matched front-end that allows for internal Di2 cable routing and battery mounting. 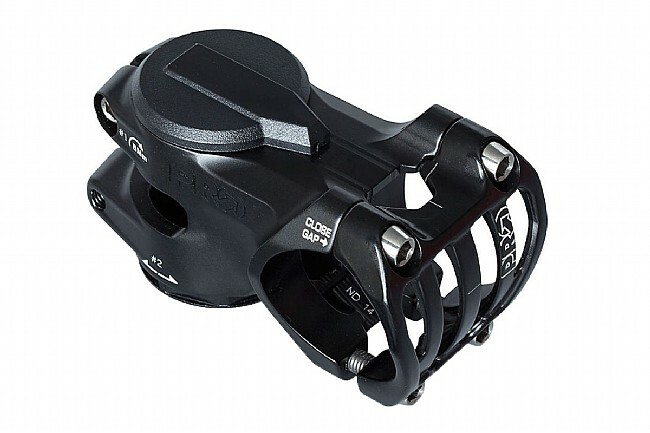 3D-forged and CNC-machined Al-7075 construction with a wide faceplate makes it strong enough to handle aggressive enduro riding, and sleek routing underneath the faceplate creates a path for a Di2 shifter wire to connect to an internally mounted battery. The BTR expander replaces the typical star nut system for adjusting headset tension and opens up space for mounting a Shimano Di2 battery inside the fork steerer. 0° rise. 31.8 mm clamp diameter. 1 1/8" steerer diameter. Claimed weight is 95 g (35 mm length). Note: BTR expander system requires a 32 mm headset wrench such as the Park Tool HCW-15. Get the right stem for your ride.